Young, fit and healthy, Fay Bahemia had no reason to fear heart disease, but an irregular blip in her heart activity signalled major trouble ahead. The emergency doctor spoke quietly into the phone, casting a sideways glance at me sitting on the bed. Nervously, I hoped this meant that I could go home now. Six hours prior, I was typing at my desk at Murdoch University when I felt a strange twinge down my left arm. It crossed my mind that this was a typical symptom of angina. So, despite the absence of other symptoms and having never experienced this pain before, I took myself to the campus clinic to get it checked out. Before I knew it, I was in an ambulance going to the hospital emergency department. I felt out of place and ridiculous—I am a young, healthy, physically fit female. I take statins and am a life-long non-smoker. And by the time I arrived at triage, I was completely pain-free. After five hours of monitoring and testing, the results were negative: I had not had a heart attack. Surely, I was good to go home? Less than 40 years ago, a patient like me would have been sent home and, within a few days or weeks, suffered a massive, possibly fatal heart attack. But this was 2015, and the doctors saw the almost imperceptible signs of Wellens’ syndrome. In April 1982, cardiologist Hein Wellens and his colleagues published a paper in the American Heart Journal. They described an ostensibly simple observation: that in a particular subgroup of heart patients, a specific electrocardiogram (ECG) pattern indicates a serious blockage in an important coronary artery. This ECG pattern strongly predicts an imminent extensive heart attack. They recommended urgent surgical intervention in patients presenting with what is now known as Wellens’ syndrome. In the study, the researchers looked at a group of patients with a condition called unstable angina, in which there is insufficient blood flow and oxygen to the heart. Often, angina leads to a heart attack. They found that, within this group, 14-18% of patients shared similar ECG readings and were all at high risk of a major heart attack. This risk prediction was supported when 75% of a subgroup who received only symptomatic control and not surgical intervention went on to experience a severe heart attack or died within three weeks. Wellens’ study created a revolution in cardiology by providing the means to prevent heart attack or death in people with a particular set of cardiac signs. For these people, Wellens’ syndrome precedes an imminent heart attack during the normal progression of coronary artery disease. Before Wellens’ syndrome was described, such patients would slip under the diagnostic radar. Exact statistics are hard to find. Although Wellens’ syndrome is reportedly common—occurring in 14% of patients at presentation to the emergency department and 60% of patients within the first 24 hours—it can be easily overlooked. When investigating patients with chest pains, doctors routinely use electrocardiography and look for the absence of cardiac enzymes (troponins) to rule out a heart attack. These primary tests are still important tools today, but, prior to the discovery of Wellens’ syndrome, negative results were usually ignored. Other investigative tests, such as angiography, were not always performed or available. Until Wellens and his colleagues reported their study, nobody had noticed the common thread among the group of patients with a high degree of stenosis, negative test results, and subsequent massive heart attack or death. When I arrived at the emergency department, I was hooked up to an electrocardiograph, which measures the heart’s electrical activity as it contracts and relaxes. A normal heart produces a characteristic pattern of peaks and troughs, which represent the different stages of the pumping cycle. An atypical ECG pattern (in height, depth, shape and duration) or rhythm indicates an existing or past heart problem. However, not all problems can be diagnosed with an ECG. Likewise, a normal ECG is not a guarantee that all is well. Electrocardiographs became acceptable hospital equipment in the 1920s, but only after considerable development and refining. Early electrocardiographs were big and heavy, taking up the space of two rooms, and requiring five people to operate them. Electrodes for ECGs had not yet been invented, so the patient’s limbs were immersed in buckets of salty water for conductivity. Today, colourful, computerised ECGs are commonplace, and data are continuously collected on portable instruments. In Wellens’ syndrome, the clues are in the T-waves on an ECG. They represent repolarisation of the left ventricle as it prepares to squeeze oxygenated blood to the body. If the T-wave is abnormal then repolarisation may be inadequate. One factor in faulty repolarisation is insufficient blood supply to the left ventricle, due to a blockage in the left anterior descending coronary artery—the artery ominously known as the “widow-maker”. Abnormal T-waves are present on the ECGs of 14-18% of patients admitted with unstable angina. In Wellens’ syndrome, the abnormal T-waves will appear in two forms. Deeply inverted T-waves are seen in 76% of cases and should be relatively easy to identify because their shape is the opposite of what they ought to be (inverted). Biphasic T-waves occur in the remaining 24%. These are usually more subtle and harder to notice, particularly if the patient appears outwardly well, which is usually the case. In Wellens’ syndrome, the abnormal T-wave patterns are often difficult to detect because they happen sporadically and only when the patient is pain-free. The ECG will look otherwise normal. Sometimes, computers analyse ECG traces and may incorrectly flag irregularities as “non-specific T-wave changes”. Continuous ECG monitoring is not printed; it is recorded and shown on the monitor in real-time. To find irregularities, doctors must manually scan saved data—after the episode has happened. Detection of these elusive and subtle markers requires vigilant ECG monitoring during pain-free episodes. In a hospital’s busy emergency department, it’s easy to see why Wellens’ syndrome can be missed. Earlier that evening, I was about to be discharged from the emergency department. My single symptom (a fleeting pain down my left arm) had vanished hours ago, and my blood tests were normal; there was no evidence of a heart attack. Apart from my familial hypercholesterolemia, I was an atypical heart patient and I would certainly be considered low risk by most emergency doctors. But they called me back. Someone had spotted a biphasic T-wave. Since Wellens’ syndrome is never accompanied by a heart attack, undiagnosed patients who are sent home with just medication to control symptoms of angina will not fare well. As described in Wellens' original study, medical management alone will not stop the heart attack. Instead, urgent surgical intervention is recommended to avoid a poor outcome. The options are either implanting a stent to widen the occluded area, or undergoing a coronary artery bypass graft. If I had been sent for a cardiac stress test, which is often part of routine cardiac diagnostic protocol, I could have suffered an induced heart attack and possibly died. The value and importance of educating doctors to recognise Wellens’ syndrome cannot be overstated. Thanks to the emergency department staff on duty that evening, I escaped the worst-case scenarios; I was admitted to the Cardiac Care Unit for high-level care and monitoring. 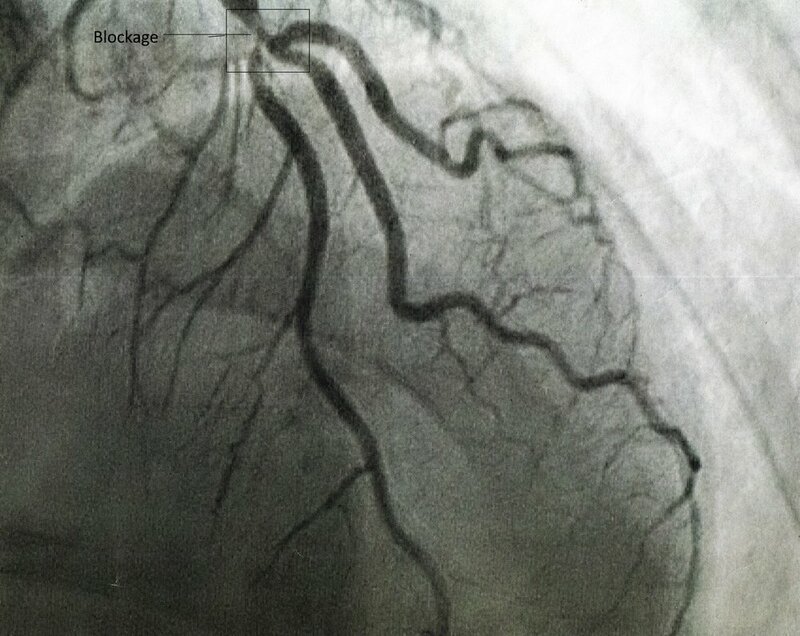 The next day, I had an angiogram that revealed a 98% blockage in my “widow-maker” coronary artery. It was inconveniently located in a bifurcation (branch) so a stent was out of the question. I underwent bypass surgery a week later. It is difficult to estimate how often Wellens’ syndrome is missed by doctors, because discharged patients might die or not return to the same emergency department. And the standard protocols for cardiac cases in emergency departments can vary from hospital to hospital, as will the doctor’s training. Perhaps the occurrence of subtle, transitory signs in a busy, high-pressure emergency department is one reason why Wellens’ syndrome can be sometimes missed. Fortunately, after almost 40 years this is becoming less common. Doctors and medical students are trained to recognise Wellens’ syndrome and follow the appropriate management protocols (angiogram, surgical intervention, and no cardiac stress test). I spoke with several emergency department doctors at the Royal Melbourne Hospital, who confirmed that Wellens’ syndrome is included in their medical studies curriculum. I was assured the presence of atypical T-waves does not escape their attention. Knowledge of Wellens’ syndrome is growing because many physicians share their case studies on internet forums, blogs and even Twitter. Sharing cases is a valuable reminder that Wellens’ syndrome does not discriminate between age, weight, and gender or health status. Published case studies showcase a wide variety of patients diagnosed with Wellens’ syndrome, how the diagnosis was reached, what action was taken, and the outcome. I heard the name “Wellens’ syndrome” for the first time after six hours of blood tests, electrolyte infusions, continuous ECGs, and blood pressure and heart rate monitoring. For all patients waiting with anxiety about their condition, the attribution of a name can come as a relief. “At least it has a name,” we say. Not so long ago, there was no name for what I had. Nobody had made the connection between atypical T-waves, negative blood tests, major coronary obstructions and subsequent massive heart attacks. More than 18 months after my surgery, I have returned to a normal, but permanently medicated, life. I attended cardiac rehabilitation sessions to regain my strength, fitness and confidence, but I have not reached the peak I once had. Emotionally and psychologically, the unexpected heart surgery rocked me off my axis, but gradually I am regaining stability and a new perspective on life.